We at Pratik Heat Products Pvt Ltd. 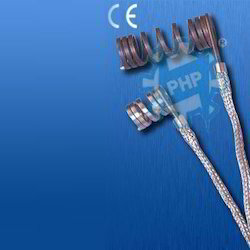 Manufacture & Exports CE Certified Coil Heaters, Electric Coil Heater, Cable Heaters, Electric Cable Heater for Hot Runner Systems. Widely used for hot runner nozzles, and manifolds, die cast nozzles, packaging machines etc. These coil heaters are also known as Cable Heaters, Spiral Heaters for Hot Runner Systems, Sprue Bush Heaters & Thermocouple Heaters. Pratik heat products ce certified heaters for hot runner systems are manufactured with premium materials and tight manufacturing controls. Also known as cable heaters or hot runner heaters, these heaters are an advance concept of thermal engineering which has a construction similar to high watt density cartridge heaters. With 40 years of practical experience, php heaters ensures highest quality standards to provide superior performance and life expectancy at higher temperatures for many diversed applications such as hot runner moulds, manifolds & machine nozzles. Designed for even heat profile. Precision fit on Hot Runner Nozzles & Manifolds. Looking for Coil Heaters ?